Here we go again! And how good it felt to be back in Halifax with Gold Medal Plates after staying away since 2007! The Cunard Centre was sold out weeks ago as we began the 2013 campaign not with a starting pistol but a full broadside of talent including the incomparable Jim Cuddy, the spectacular Anne Lindsay (dare I say, she stole the show), the great Sam Roberts and dazzling local hero Bruce Guthro, hilariously wry emcee Shaun Majumder and a glorious LEGION of Olympians led by GMP’s newly appointed National Athletes Advisor, Marnie McBean. Chefs came from Antigonish, Shelbourne, Mahone Bay, Wolfville and Lunenburg as well as Halifax, and the culinary standards of their dishes were mightily impressive, full of imagination and making telling use of dazzling local ingredients. With Nova Scotian wines also front and centre (more about them from David Lawrason), it’s apparent that the gastronomy of the province is simply soaring. The judges? Our local leader from years gone by, Bill Spurr, restaurant critic for the Chronicle-Herald, returned as Halifax Senior Judge. Alongside him was chef and educator Alain Bossé, (splendidly sporraned and certainly living up to his moniker of “The Kilted Chef” as he sported the blue provincial tartan), chef, educator and restaurateur Renée Lavallée, entrepreneur and wine producer Pete Luckett and certified sommelier, educator and culinary advocate Amy Savoury – a most powerful posse. There was considerable debate among us about who should receive the bronze medal, but none at all about silver and gold. In both cases we were unanimous in our enthusiasm. Jason Lynch of Le Caveau restaurant in Wolfville won the bronze. He presented a delectable little treatise on Martock Glen Chukar partridge, starting with a roulade of the pale breast meat, subtly seasoned and wrapped in caul fat to retain its natural juiciness. There was a fabulous salo-cured liver sausage, a croquette of the confited leg meat and a broad stripe of coffee-spiked sweet-potato purée across the plate. He finished the dish with an Italian plum compote and a pure jus of the partridge roasting juices. 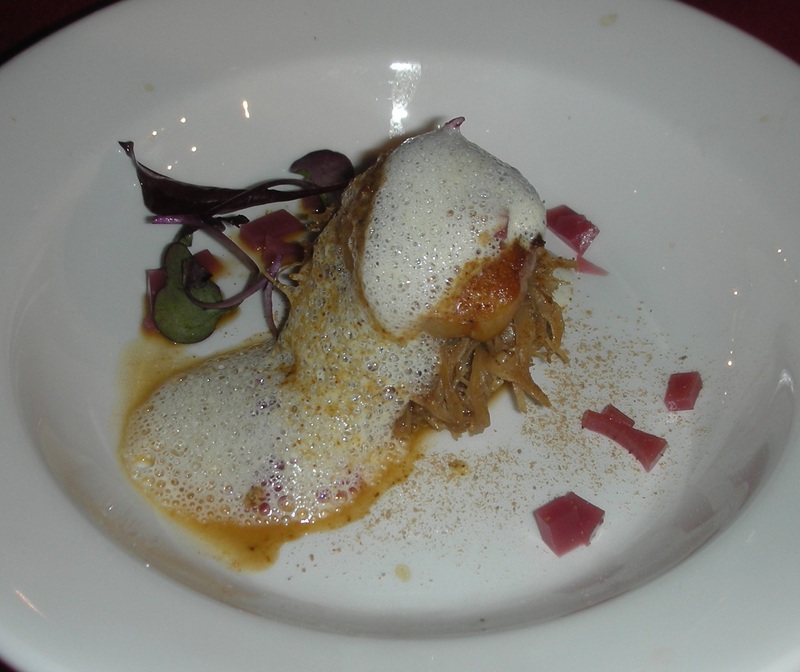 “It’s all about terroir,” said Chef Lynch, as he introduced the dish – in this case, the terroir of the heart of the Annapolis valley, which was also the source for his wine, Domaine de Grand Pré’s Vintner’s Reserve Castel, 2012, a big, impressively muscular red from the Castel variety that offered interesting caraway and plum notes and worked particularly well with the sausage. 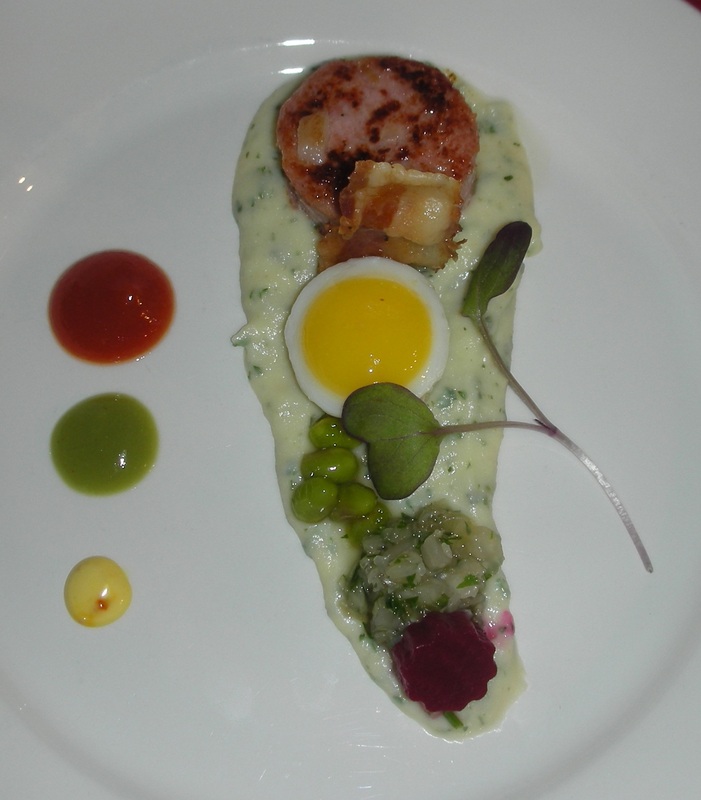 Our silver medal went to Terry Vassallo of Café Chianti in Halifax who offered a dish he called Savoury Tiramisu. It seemed complex when read on the page but turned out to be full of careful harmonies and balance. Chef began with a perfect little duck-egg brioche, dipped in an espresso-foie gras butter and topped with a moist ragu of pulled duck meat spiced with sumac, fennel and the merest hint of sugar and salt. On top of this lay a scallop that had been smoked in sea grass until it acquired a gorgeous fragrance and poached in a court-bouillon of the duck bones. A foamy mousse of jerusalem artichoke topped the dish which was garnished with morsels of cloudberry gelée and a final breath of chanterelle dust. Chef Vassallo’s wine was a rosé pressed from Léon Millot grapes. Rich and tangy, with a trace of residual sugar and an aromatically floral nose, it reminded me of plum and cherry and was a fine match to the duck. The first gold medal of 2013 campaign was awarded to a chef who also won gold the last time GMP was in Halifax, back in 2007 – Martín Ruiz Salvador of Fleur de Sel in Lunenburg. He proposed an East Coast Breakfast that again looked like an entire menu on the page but was totally coherent and elegant on the plate. The prime protein was a tender drum of pig’s-head mortadella, set on a bed of a hugely flavourful brandade of salt cod and parsley root. A perfectly fried quail egg (its yolk still runny) sat on a disc of bread beside a tiny rasher of cured pork jowl. The key breakfast component of “baked beans” was a spoonful of firm edamame poached with honey and ginger while a tiny mound of beet-green and nappa-cabbage kimchi stood in for chow-chow. A turned pickled beet the size of a thumbnail was an emphatically purple garnish. Three dots of colour on the side of the plate – like traffic lights – were fabulously tasty: a tomatillo confit, a tomato-and-garlic reduction by way of ketchup, and a mustard seed and saffron mayo, the saffron the only ingredient on the plate that was not from Nova Scotia. Chef created a cocktail to go with this dish, a version of a Mimosa made with Benjamin Bridge Nova 7 sparkling wine with a dash of Van Dyk’s wild blueberry juice, local honey and thyme syrup, a drop of beet juice, lemon juice, salt and a shot of Iron Works pear eau de vie. It was a fascinating and complex drink that worked brilliantly with the dish. So we have our first champion of the campaign, a strong contender indeed to represent the Maritimes! Next week, Edmonton and Winnipeg: I can’t wait. The 8th Gold Medal Plates season opened on October 17 in Halifax with Nova Scotia wines owning the podium. Six of nine chefs chose to pair their creations with homegrown wines and spirits. The crisp acidity of the Nova Scotia sparklers, whites and even the hybrid-based reds proved an excellent food-matching ingredient. The gala evening was also the debut of the wines of Andrew Peller, the Gold Medal Plates 2013 National Celebration Wine Sponsor. Canada’s largest family-owned winery is supplying wine from its large portfolio during the awards, auction and entertainment segment of the festivities. This night they offered Trius 2012 Sauvignon Blanc and Wayne Gretzky No 99 Cabernet-Merlot, both from Ontario’s Niagara Peninsula. But it was three local wines that were honoured in the Best Wine of Show competition. I was joined in the judging by two leading Atlantic wine critics. Craig Pinhey from Saint John, New Brunswick, is an accomplished freelance wine and beer writer for the New Brunswick Telegraph Journal, a broadcaster, educator and a veteran judge at Canadian wine competitions. Sean Wood of Dartmouth is the weekly wine columnist for the Halifax Chronicle-Herald, and the author of Wines of Nova Scotia, the first comprehensive profile of the province’s wineries. In my view, his wisdom and critical eye have been essential to development of Nova Scotia’s wine industry. A Nova Scotia bubbly – L’Acadie Vineyards 2010 Vintage Cuvee Brut – captured the Best of Show Award. The organically grown sparkler was poured as a VIP Reception wine by ex-Okanagan winemaker Bruce Ewart, who arrived in the nick of time from his Gaspereau Valley winery, where harvest was in full swring. He also left early to get back to work (around 11 p.m.) missing the announcement of his win. The award gives Bruce a leg up in a draw for a week at Borgo San Felice in Tuscany. The second-runner up was one of two rosés served this night, a lovely, aromatic pink wine called Lavender, by Avondale Sky Winery. As it happens, the same wine was paired with the dish of silver-medal-winning chef Terry Vassallo of Café Chianti in Halifax. The Gold Medal Chef in Halifax was second-time winner Martín Ruiz Salvador of Fleur de Sel. 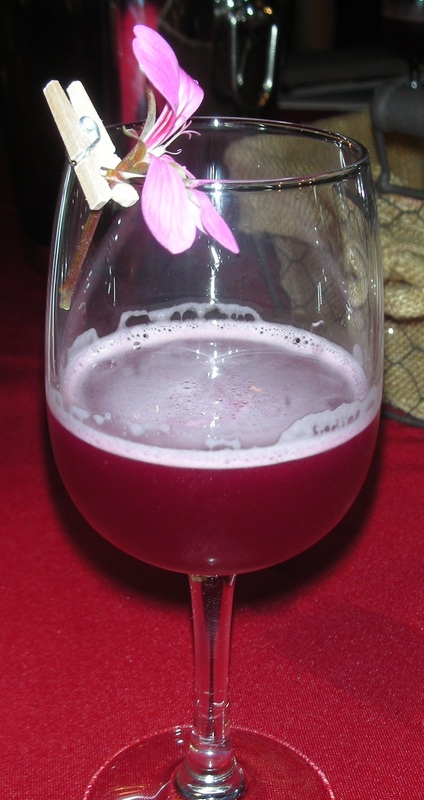 See James Chatto’s report for full details on this “breakfast” dish, but let me explain his most unusual beverage, a very creative and effective “Mimosa” made with Benjamin Bridge Nova 7 sparkling wine, IronWorks Distillery pear eau-de-vie and a concoction of beet and blueberry juice. The Mimosa was also a favourite of the wine judges, finishing fourth. Other Nova Scotia wines, generously donated, included Domaine de Grand Pré 2012 Castel, Petite Riviere 2012 Silk Sheets Red, and Blomidon Estate 2012 Rosé. Wines from other provinces included Nk’Mip Cellars 2011 Chardonnay and Quails’ Gate 2011 Pinot Noir from B.C.’s Okanagan Valley, and Wayne Gretzky #99 2012 Cabernet Merlot from the Niagara Peninsula.